November 1st marked the first day of the 2-day special world event, El Día de Los Muertos (The Day of the Dead); which is a reflection of a traditional Mexican and Latin American celebration. This is just a short article to describe some of the items/outfits from this event. 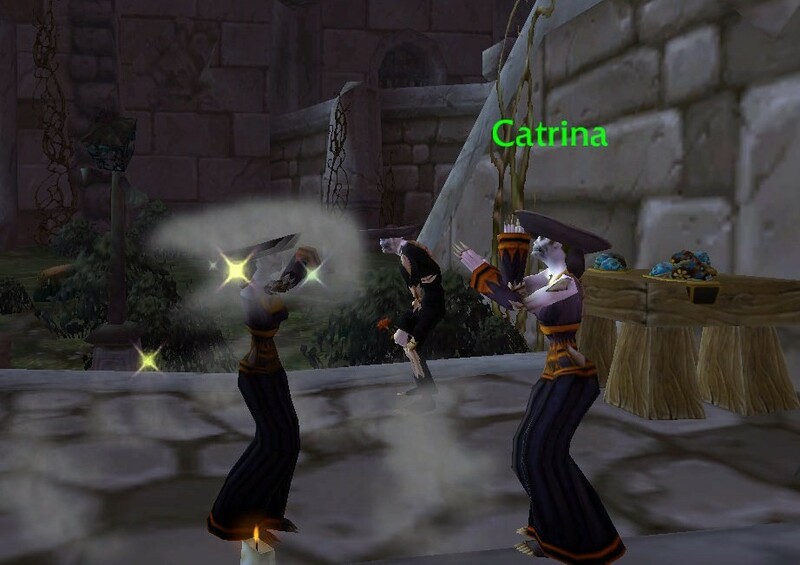 After you /Dance with Catrina in any major city graveyard, you will get the achievement Dead Man’s Party and also gain the buff Honor the Dead – which changes you too look like Catrina, or her friend Chapman, depending on your gender. 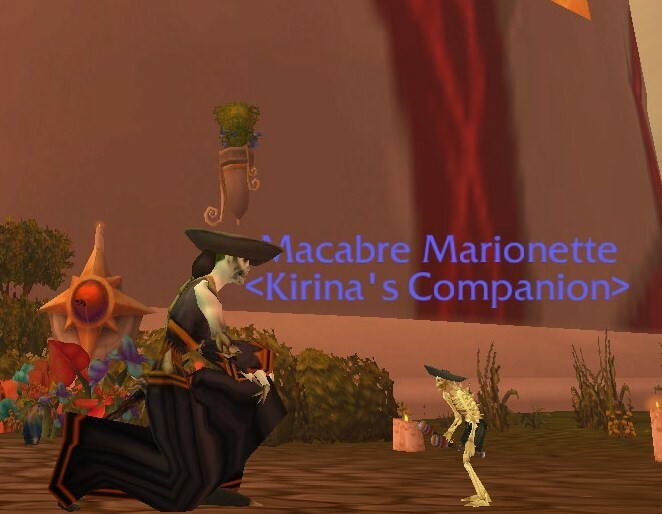 Kirina gaining her Honor the Dead buff. The Death Speaker Robe is a fairly common drop from Death Speaker Jargba from Razorfren Kraul – as seen in my Hallow’s End Outfit article. The Haliscan Brimmed Hat is the reward from the quest Nice Hat…, which requires one to kill Don Carlos in the Caverns of Time. Doing this fight in heroic mode allows for the NPC to drop Don Carlos’ Famous Hat, which has the same model of its common equivalent, however, it allows the wearer to summon a coyote companion. 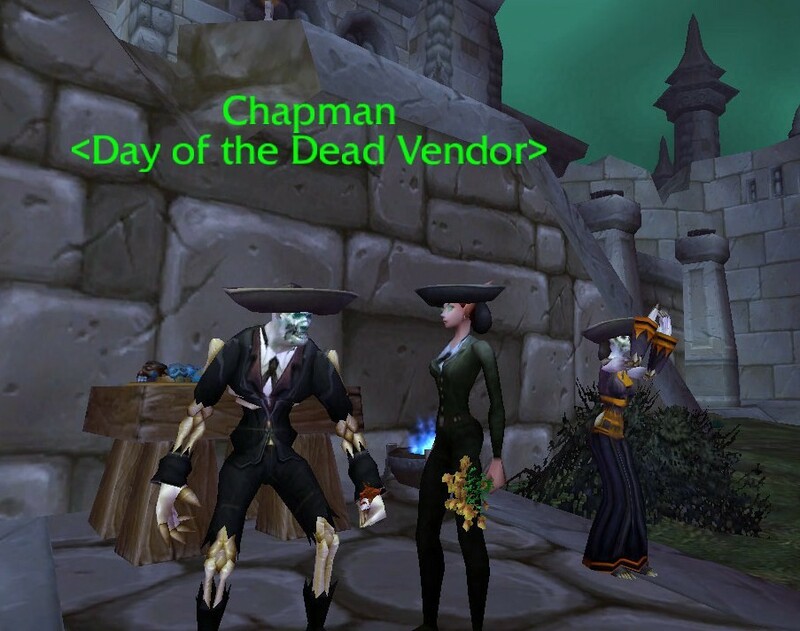 To look like Chapman without the buff, just wear a simple tuxedo set along with one of the sombreros mentioned above. And, of course, the outfit effect is more realistic if your character is an Undead. The NPC’s jacket is a little different than the Tuxedo Jacket…but, to my knowledge, I do not think one like what Chapman is wearing exists in-game for players to wear. Chapman is also a vendor for this event. Along with selling candles and candy, he sells some items for another Day of the Dead quest: the Bread of the Dead recipe and the Orange Marigold/Bouquet of Orange Marigolds items. Both of these allow the wearer to see the spirits around the graveyard for a short period of time – which is how you gain The Grateful Dead quest. However, the Orange Marigold is not an equip-able item, and will disappear after the event is over. 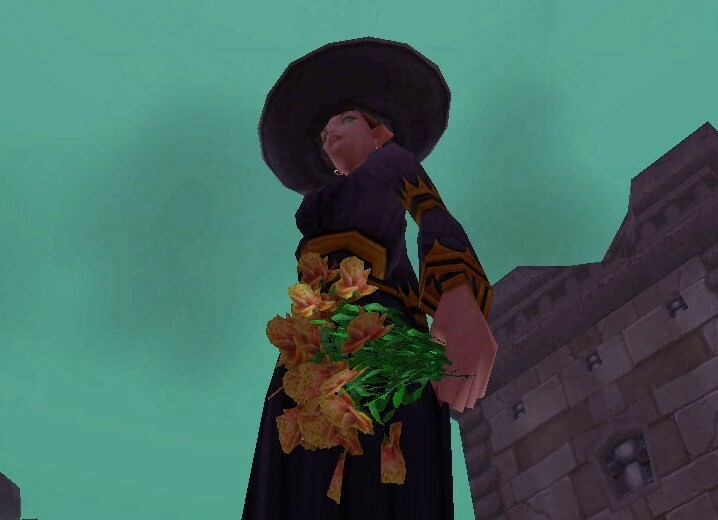 “Splurging” on the Bouquet of Orange Marigolds allows you to have a permanent off-hand, but the use effect can only be used during the Day of the Dead event. These orange flowers also make a great fall-time bouquet off-hand to wear in other outfits. Another item Chapman sells is the Whimsical Skull Mask, a common, yet exotic, mask in the traditional Day of the Dead skull motif. Previously thought to disappear after the event is over, it actually is a permanent item! Kirina with her Macabre Marionette skeleton summoned. 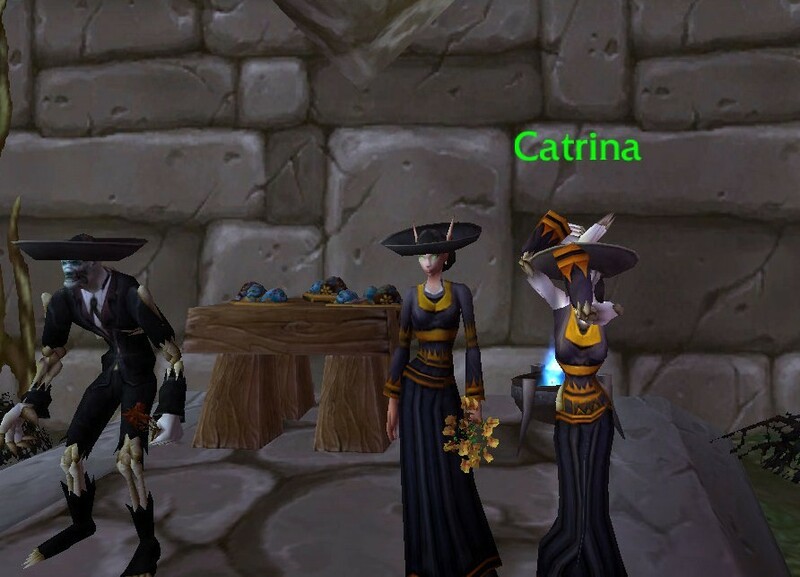 The Orange Mageweave Shirt would go great with this outfit as well, as both shirts match the colors found in the flowers of the bouquet off-hand. The Big Voodoo Mask could be replaced for the Whimsical Skull Mask. 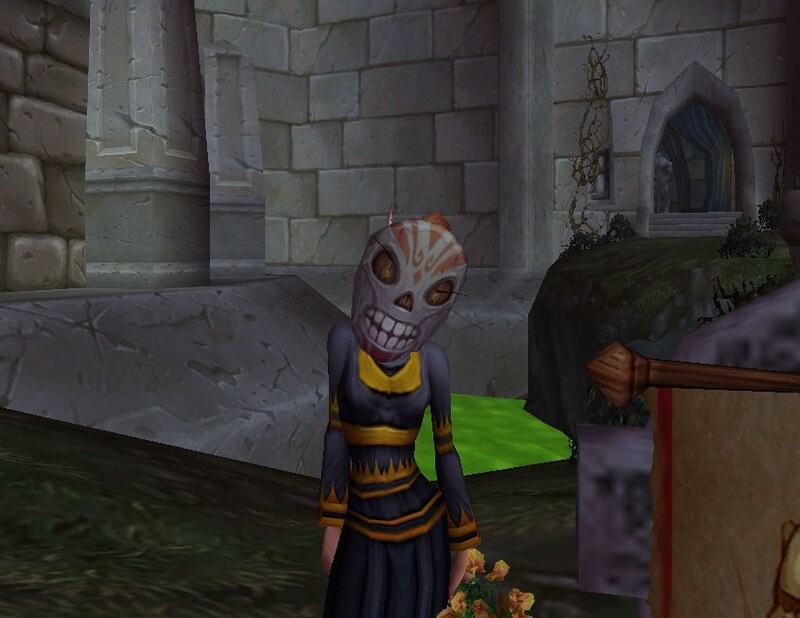 Kamalia on the Kirina’s Closet forum posted up her little spill over The Day of the Dead event. Check it out! 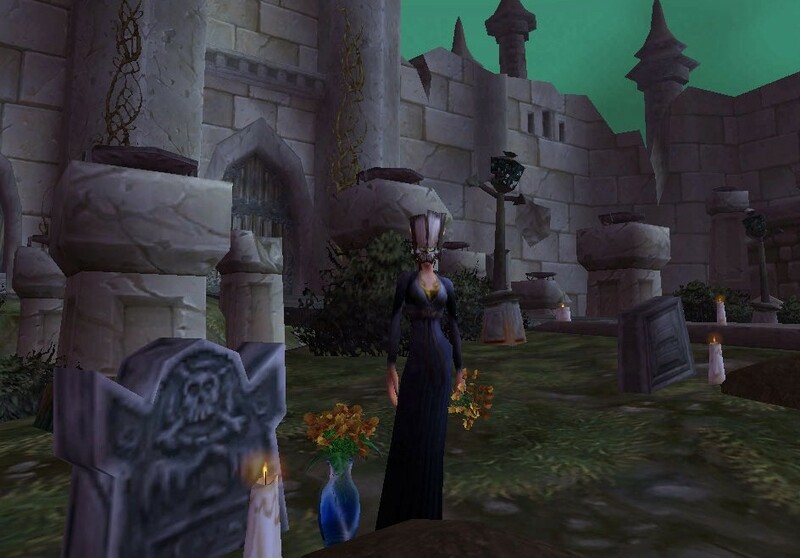 Have pictures of how your character enjoyed this event and/or Hallow’s End? Don’t be shy…share them with us!